Last December Edo Segal wrote a post for TechCrunch titled “The Dawning Of Ambient Streams” on how the evolution of Lifestream technologies will bring about some major changes in our future. We will be seeing the first swells of this coming tsunami in the years to come, but for our children the ambient sense will play a bigger and bigger role as it slowly evolves and weaves itself into their consciousness much like Google search weaved itself into their memory functions. He then goes on to describe the building blocks that make up what he calls an ambient stream and then provides a diagram to illustrate how they may enter our lives. Before these building blocks can create an ambient stream which is not overwhelming, all of this data needs to pass through a filter. 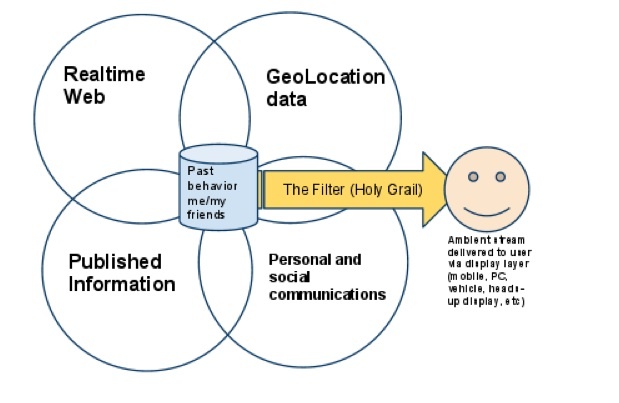 The Holy Grail is a filter which only serves up information which is relevant based on who you are, your social graph, what you or your friends are doing now, what you or friends have done before, and in context of other information you are consuming. It needs to be delivered wherever you are and on whatever device or display can deliver the ambient stream: mobile phone, laptop computer, TV, heads-up display in vehicle or inside your glasses. Definitely some interesting thoughts which make a lot of sense as we move forward in the years to come and find ways to manage the data. via TechCrunch | Beyond Realtime Search: The Dawning Of Ambient Streams.